Francis Quirk was an Ossabaw Island Fellow and spoke fondly about the institution with Pennsylvania friends. We believe he may have also capitalized on his time in Georgia to reach out to patrons and obtain other commissions. Note that he has a portrait in the Georgia Museum of Art. We also believe he may have visited the region on multiple occasions. 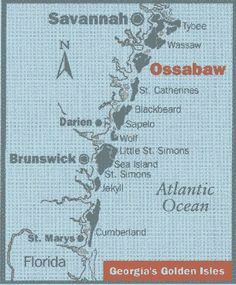 Many were painted while spending time at the Ossabaw Island Foundation. In order to continue to balance their operating budget they are no longer able to support complimentary stays. We have been able to find images of several works painted at the Island. Glossy White Faced Iris- This painting was featured on the pamphlet for Quirk's solo show at Lehigh in 1973. The pamphlet only showed this black and white image. 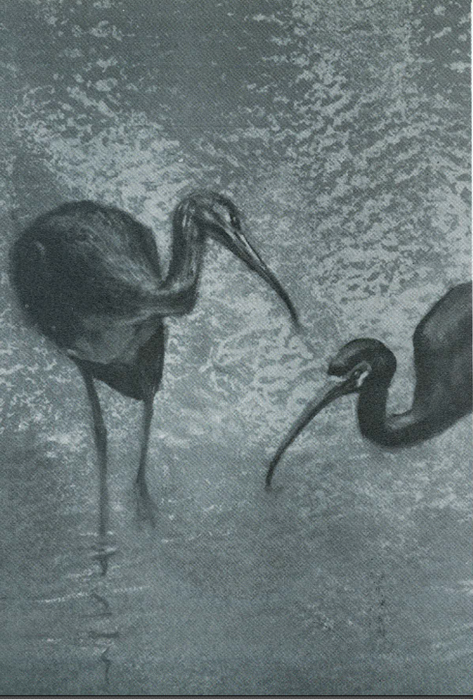 Black and White Image of Glossy White Faced Ibis by Francis J. Quirk oil on Canvas From 1973 Exhibition Pamphlet at Lehigh University. At the 2016 Maine auction of paintings from his estate, we were pleased to see the actual painting and we provide a color image below. In comparing the images, we can see that the pamphlet showed a cropped portion of the original image. The following images were also identified at the Maine sale. One interesting aspect of this set is that they include a number of different styles and media including oil, pastel and watercolor. 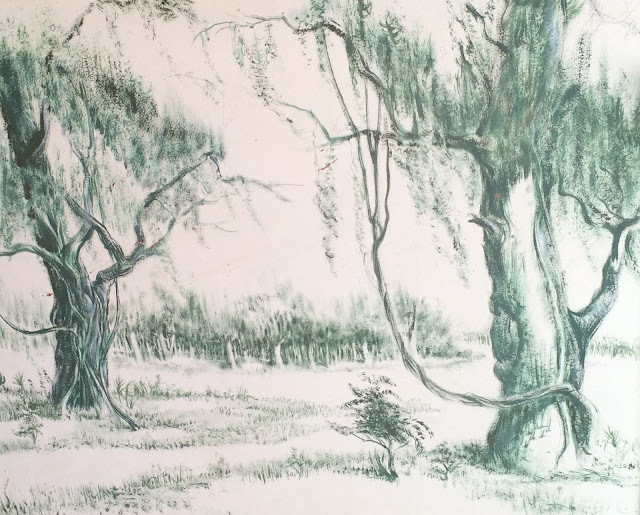 The first, is a pastel of a copse of trees that is nicely executed. The second is a watercolor of wetland birds. The trees are painted in a light ethereal manner. The next work depicts wading birds in wetlands with some birds in flight in the background. Pastel of sky with wetland bird accents. This work is reminiscent of Japanese screens in which the birds may make up just a small portion of the work. This monochromatic oil painting is unusual in that it is a technique not frequently used by Quirk. This painting demonstrates Quirk's strength as a representational draftsman of great technical skill. This is one of two paintings at the Maine sale. Unfortunately, we ran out of memory and did not capture an image of the other painting. We hope it will if re-emerge in time. 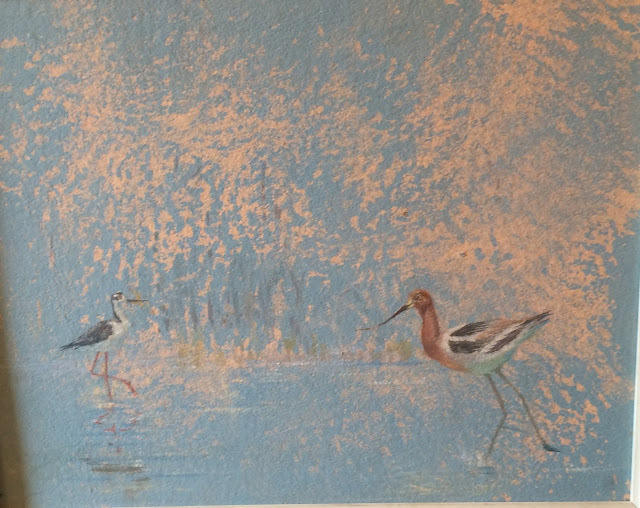 The final work is another oil painting of wading birds.